I don't think that I've ever heard anything quite like this before – I almost (almost) guarantee that you, yeah you, have probably never heard anything quite like it, either. Aside from this rather incredulous sounding opening gambit, I'd like to introduce you to a trio of musicians (or as they say, "harlem born brain-squid-child") from New York City making self-styled "brasshouse" music: Too Many Zooz. One of them plays like, a trumpet thing, another of them plays a large saxophone (? ), and another is a one-man beat-progenitor aka percussionist (I guess). They create dance music that's made up only of brass and beats: all organic, all live/living instruments. With SO MUCH/MANY electronics around right now it's a refreshing take on music made to make you move your feet. It's kind of like swing, but without the big band-type structure, with more housey rhythms and looping melodies. Plus the blare of brass is p much so foreign in this context that it might as well be a new instrument. 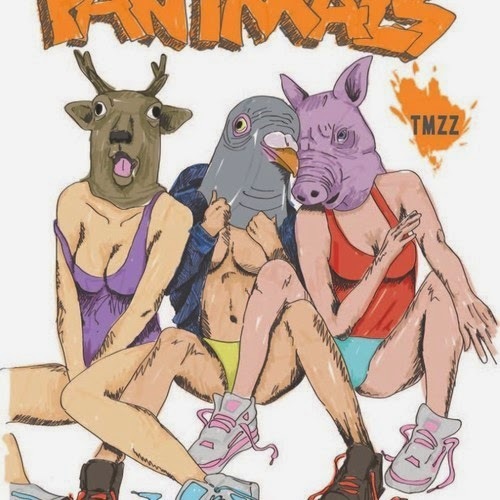 They recently released an EP, Fanimals, which is the perfect showcase of their sound. Since I've already spent what seems like loads of time explaining their uniqueness, I'ma focus on just one song, the nicely titled 'Turtledactyl'. Built on a foundation of booming bass drum and syncopated baritone sax blasts, the trumpet laces frenetic patterns over the top, a glorious four minutes of soulful, heartfelt dance music that is as far away from EDM as is humanly possible because there is no E involved. Not unless you count the mastering / production – little hints of infrabass and an uplifting white-noise-whoosh towards the end – courtesy of Team Supreme member, JNTHN STEIN. Reaching a subtle crescendo of harmonising brass, it's got this chemistry that you can't help but succumb to, a kind of sweaty and cheerful joy. In comparison to the rest of the stuff on their EP, it's melodically and dynamically more tame, but there is more wildness on their EP in the form of more dubstep-y (brass-step?) numbers, and bursting-cheeks trumpet virtuosity. Good on them I say. If you wanna hear more go stream the Fanimals EP on SoundCloud, or mosey on down to the Too Many Zooz Bandcamp and buy it for $5 or more. Oh, and if you need to see actual evidence of their greatness irl, then please check out this video of them performing at a subway station in New York.